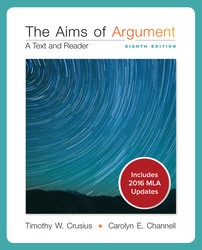 This text recognizes that people argue with a range of purposes in mind: to inquire, to convince, to persuade, and to negotiate. It offers a clear learning sequence rather than merely a collection of assignments. Case-making is then carried over into learning how to persuade, which, requires explicit attention to appeals to character, emotion, and style. Finally, negotiation, which amounts to finding and defending positions capable of appealing to all sides in a dispute or controversy.